Having Princess Anne visit and open the distillery is quite prestigious! This makes for interesting reading as to the possible whereabouts of one of the pumps. The building is now open to the public, so worth a visit. The north end is a cafe, with some artifacts displayed or turned into furniture. Much of the building structure and overhead crane gantries are visible. The south end is a distillery with (paid) public tours. I did not do the tour, but was offered a complementary gin at 10:00 in the morning for showing an interest! Happy to be corrected here, but I believe that one of the pumps from No5 Pumphouse was salvaged and is on display the the back of No3 slip in the Historic Dockyard. An impressive piece of machinery. I'm working on the Gannet at the moment, so I'll try to get a picture of it if I get 5 minutes. Kinda contrasts with the two days it took us to empty No2 dock back in March. I typed this out as a request for someone, as it is already typed I thought I would add it! The Chatham Dockyard Pumping Engines. The extension works at the Royal Dockyard, Chatham, include four large dry docks in connexion with the extensive repairing basin, which itself has a water area of 21 acres. In dry-docking a vessel, she is floated from the basin into the dock, the entrance of which is then closed, and communication is thus cut off from the basin. The dock has then to be pumped dry, and for the despatch of business it is desirable that, whenever necessary, each dock should be deprived of its contained water without any loss of time. To effect this a fine set of pumping machinery - probably the largest of its kind for this purpose yet set to work - has been erected in an engine house conveniently situated near the docks. 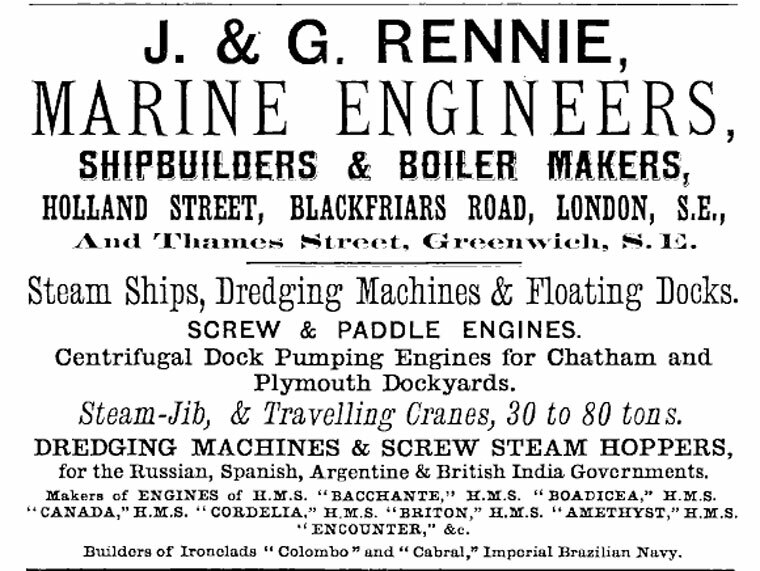 This machinery, which has been made and fitted up by Messrs. J. and G. Rennie, of Blackfriars, underwent its official trial on Tuesday last under the superintendence of Mr. Eames, the Engineer-in-Chief of the Chatham Dockyard, and Mr. G. B. Rennie. The nature and extent of the arrangements for withdrawing the water from the dock render a general description of them desirable in order that the importance of the results obtained may be realized. The engine-house is a handsome red brick building 77ft. in length and 48ft. in width, and around it runs an arcade carried on brick piers, the external effect being very pleasing. In the engine-house are placed the engines and pumps which form the especial subject of this notice, as well as three smaller engines used in connexion with other operations pertaining to the docks. The boiler-house adjoins the engine-house, forming, in fact, a continuation of it, and having the same external appearance. It is 98ft. long and 48ft. wide, and contains nine boilers of the Cornish double-flued type, each 28ft. in length and 6ft. 6in. in diameter. Two of the boilers are kept in reserve, seven being ample for supplying steam to the various engines requiring it. The chimney shaft is about 80ft. in length and 7ft. internal diameter. Two of the docks are 468ft. in length by 110ft. in width at the top, and at the ordinary water level of 30ft. 6in. from the floor of the dock the cubical contents are about 34,830 tons or 7,800,000 gallons of water. The other two docks are of slightly smaller capacity, their contents being 30,000 tons of water each at the same level. Along the front of each dock and beneath their entrances runs a culvert 7ft. in diameter, which is carried through the pump wells in the engine-house, a distance of 1,000ft. from the farthest dock. Into this culvert each dock has outlets, through which, by an arrangement of sluices, the water can be drawn from it. There are also two inlets, governed by sluices, to each dock from the basin, and by means if which the dock can be filled. 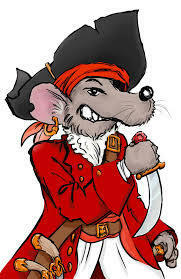 There is also an arrangement by which the docks can be filled directly from the River Medway if necessary. From the pump wells the main culvert is continued to the basin as well as to the river, into either of which the water fro the docks can be discharged, the arrangement being controlled by sluices worked by hydraulic power, by which power also the sluices of the docks are actuated. The docks were constructed under Sir Andrew Clarke, the late, and Colonel Pasley, the present, director of works, under the superintendence of Mr. Bernays, the resident engineer. The main pumping engines are on the compound principle with overhead vertical cylinders, the high-pressure cylinder being 43in. in diameter and the low-pressure 75in. with a stroke of 2ft. 9in. The cylinders are steam jacketed, and the engines are fitted with surface-condensers, in which water from the culvert is used for condensing. The engines are "speeded" to run at 100 revolutions per minute, which speed they regularly maintained throughout the recent trial, using steam at 50lb. Pressure in the boiler. They are of 200-horse power nominal, but indicate up to 800-horse power. These engines drive a horizontal shaft on which are two bevil wheels gearing into similar wheels on the pump shafts, which are carried down the pump wells to the centrifugal pumps. The gearing is so proportioned that, with the engine running at 100 revolutions, the pumps are working at 106 revolutions per minute. At the further end of the engine-house, and in a line with the horizontal pump-shafting, is a pair of trunk engines of 200-horse power, nominal, and indicating up to 800-horse power. These engines formally belonged to Her Majesty's ship Forth, and are kept in reserve in case of any accident to the man engines, in which event the could readily be coupled on to the pump-shaft. Besides these engines, there is a smaller pair of 20-horse power working a pair of ordinary bucket pumps, which are used for keeping under any leakage of water into the docks during the time vessels are under repair in them. The fourth pair of engines are of 30-horse power, and are used for pumping the water into an accumulator, on the Armstrong system, where it is stored under pressure of 700lb. Per square inch, for use in the hydraulic arrangements. The work done by hydraulic power is the operating of 40 sluices and 20 capstans distributed about the dockyard. All engines are bedded on granite foundations, with which material also the engine-house is paved. The two centrifugal pumps are each 8ft. 6in. in diameter and work in wells 11ft. 6in. diameter and about 40ft. deep. The suction pipes are 4ft. 3in. in diameter, increasing to 6ft. diameter at the "rose" end. These pumps are of a very special character, and were so designed by Messrs. Rennie that, when working together, they would not have to discharge against the greater head of water than 15ft. The principle consists in arranging the pumps at different levels, that difference being 15ft. In working, the water is pumped from the dock until it has been reduced to the level of the "broad altar", which is 15ft. below the water level, both pump wells being open to the culvert. When the water has reached the above level a communication is made between the two wells by means of a sluice and the suction sluice of the higher pump is then closed. By this means the lower pump delivers to the higher one, and the higher one delivers it into the basin. The pumps are so designed that the water is discharged through the curved outlets, instead of at right angles, as in ordinary centrifugal pumps. The curved form was decided upon by Messrs. Rennie after exhaustive experiments, that being the shape which gave the best results. Upon the occasion of the official trial the dock selected was one of the larger size, and the entrance to which is about 800ft. from the engine-house. At starting, the water stood at a level of 30ft. 6in. from the floor, the estimate quantity being 34,830 tons. The water stood at the same level in the basin as in the dock, and was kept down to that level in the basin during the time the contests of the dock were being discharged into it, in order that the pumps should work against an equal head throughout; in other words, that the resistance offered to the discharge of the pumps should remain uniform during the whole time of discharging. In Messrs. Rennie?s contract with the Government it was stipulated that the upper portion of one of the smaller docks, from the water-line down to the level of a kind of gangway round the dock known as the broad altar, and the cubical contents of which are 18,000 tons, should be emptied in 50 minutes. The lower portion, or that from the broad altar to the floor, containing 12,000 tons, was to be pumped dry in 70 minutes, or the dock emptied in exactly two hours. At the trial the performances of the pumps were considerably in excess of this, a point upon which both the makers and the Government are alike to be congratulated. The capacity of the upper portion of the large dock is 20,000 tons of water, and this was pumped out in 39 minutes, while the lower half, which contains 14,830 tons, was cleared in 66 minutes, the whole operation thus occupying 1 hour and 45 minutes, or a quarter of an hour less than the time stipulated for in the contract for the smaller docks. This result is highly satisfactory, and elicited the unqualified approval of Mr. Eames. The fuel used during the trail is stated to have been 2 1/2lb. Per indicated horse-power per hour. The engines and machinery were in charge of Mr. Phillips, Messrs. Rennie's superintendent. Wow, thanks Kyn, never seen the chimney before. File ADM 195/7 at the National Archives, Kew. I was lucky enough to 'gain' entry into this building about 20 years ago, not long after the yard had shut, still had some of the pump equipment in it, but a lot had gone, even then. Unfortunately it was before the days of digital cameras, so no pix. Maybe we could use it as KHF hq? Pump House No.5 is a Grade II Listed building due to architectural and historic interest. The pumping station was built in 1873 as part of a massive building program to expand the dockyard in preparation of the construction of iron clad warships. 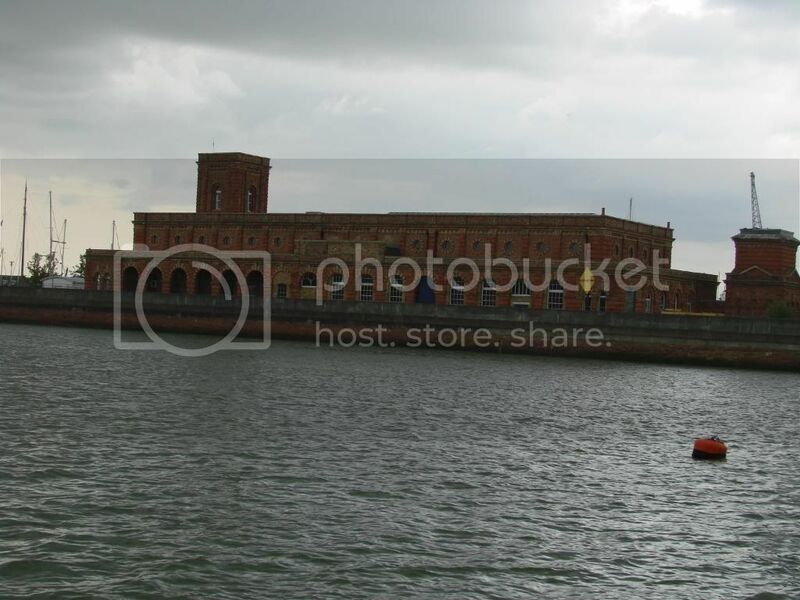 Situated between the river and dry docks that it was built to pump thousands of gallons of water out of to allow men to work on the hulls of ships, the building is a beautifully ornate structure with arcaded elevations with a chimney and tower at each end. The report concluded that the building was of special architectural and historic interest as a Grade II listed building. However, in accordance with PPG15 guidance, the building should not benefit from dual designation as a scheduled ancient monument. Our report formed the basis for an application to English Heritage for de-scheduling.